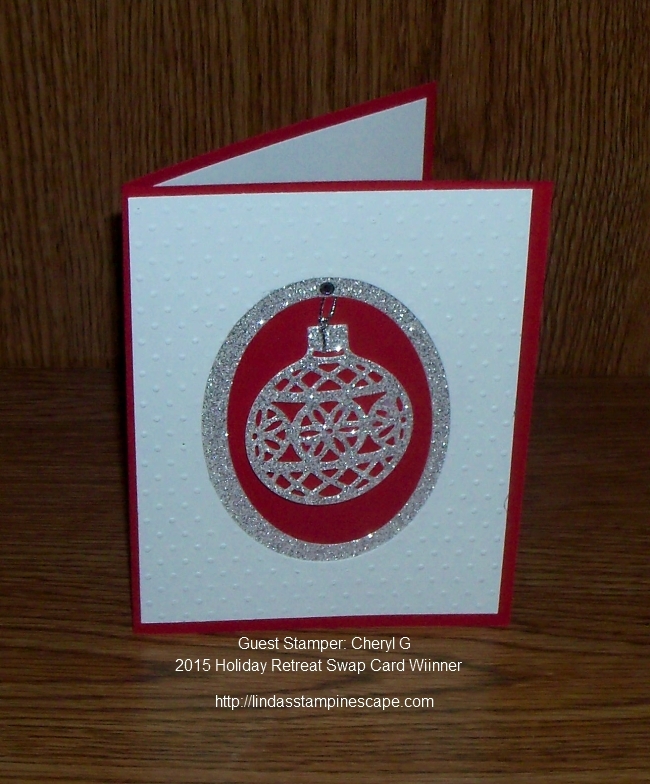 Retreat Swap Card Winner: Cheryl G.
The white cardstock was embossed with the Perfect Polka Dots folder (retired). If you don’t have this one our current “Softly Falling” embossing folder would work great. The Real Red and Whisper White were cut out with the Oval Framelits Collection … it makes the perfect frame to showcase the beautiful ornament from the “Delicate Ornament” Thinlet Dies. These can be purchased separately or with the coordinating “Embellished Ornaments” stamp set as a bundle – 140857. Congratulations to Cheryl … I can’t wait to see what goodies she is going to pick out with her gift certificate. I will be back tomorrow with another “Simply Sunday”, till then have a wonderful weekend.